Looking to spend a little more money on higher quality acoustic guitar amps? Take a look at the Ultrasound AG-30. This amp received a Player's Choice Award in 2008 in Acoustic Guitars. There is no doubt this is a quality amp priced at a reasonable price. This guitar amplifier allows you to get the sound you're looking for. You can customize the bass, treble, mid-dip and shape control. The amp reproduces a very clean a sound because it is designed to eliminate any feedback. While the 30 watts may not be enough for large shows, it's great for small gigs, recording, as well as for practice. 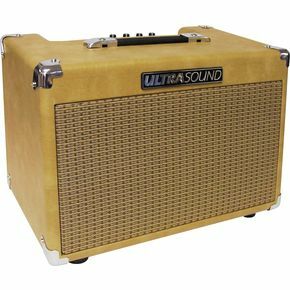 Priced at $199, this is very affordable for the quality of the amp. No wonder it’s been the best selling compact acoustic amp for the last 5 years. See more great acoustic guitar amps reviews at Acoustic Guitar Amps.